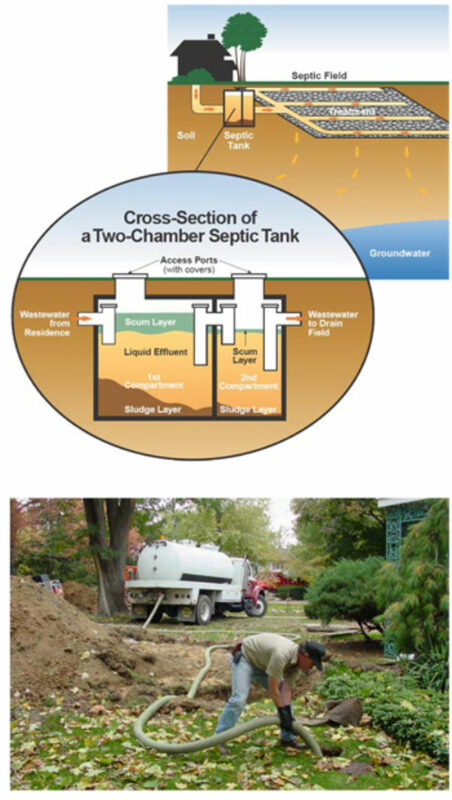 Waste separates into sludge, liquid and scum inside the septic tank. Solids that can’t be broken down settle at the bottom of the tank and must be pumped out regularly. Naturally occurring ‘good’ bacteria in the soil feed on and break down harmful chemicals and bacteria, completing the treatment process and returning clean water to the groundwater system. Tanks need to be inspected and pumped on a regular basis (recommended every three years) to remove the accumulated layers of scum and sludge. A licensed septic professional should be used for any repairs or service as deadly gases are present in a sewage holding tank. Never enter a septic tank yourself! Pumping out the septic tank in summer or early fall is recommended as it allows enough time before winter for the bacteria to start working again. Plant grass or bedding plants, water sparingly and do not fertilize. Do not plant large trees or shrubs as their roots can clog the system or damage pipes. Keep rainwater and sump pump runoff away from the septic field. Do not build over the septic field. Insulate your system against the cold. Allow grass to grow longer or put down a layer of loose hay or straw. Reduce the amount of water entering the system. Install water‐efficient appliances and devices such as low‐flow toilets and shower heads, and maximize the capacity of your dishwasher and washing machine. Don’t use a garburator as it can double the amount of solids in your tank. Keep out solids that could clog up the system and chemicals that harm the good bacteria. This includes fat, grease, oil, coffee grounds, kitchen waste, personal hygiene products, paper towels, medications, disinfectants, bleach, etc. Watch for these warning signs of a failing septic system. If you notice a problem, it is important that you take action immediately to protect your home, your family’s health and the environment. Contact a qualified practitioner to advise you on how to proceed. Soft areas or patches of lush growth on top of the septic fieldReduce the amount of water entering the system. Install water‐efficient appliances and devices such as low‐flow toilets and shower heads, and maximize the capacity of your dishwasher and washing machine.